Why can I no longer see my files or map a drive to my NAS in Windows 10? The latest update from Windows 10 disabled SMB v1.0. The D-Link DNS line of NAS devices uses SMB v1.0 and does not support SMB 2.x. You must enable SMB 1.0 in Windows 10 to map a drive and view drive content, or enable NFS on the NAS and in Windows. 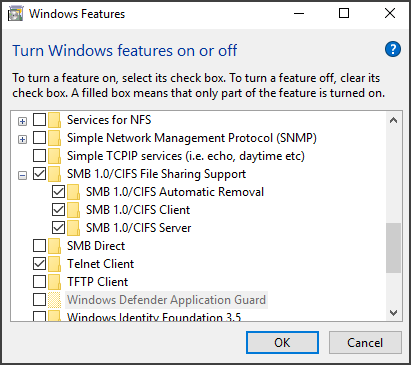 To enable NFS on Windows 10, you can see from the screenshot below, check the Services for NFS box instead of SMB. Then log into your NAS, go to Management > Application Management > NFS Service. Note: SMB 2 and higher will NOT be implemented on any of D-Link''s NAS devices since they all have been discontuned several years ago. Use NFS as an alternative to SMB. Step 2: Scroll down to SMB 1.0/CIFS File Sharing Support and check the box. Note that CIFS Client is the only required box to be checked.